The Caprivi Strip is a narrow strip of land in the far northeast of Namibia, about 400 kilometres long. The East Caprivi bordered by the Kwando, Linyanti, Chobe and Zambezi Rivers is a region of swamps and flood plains. It was obtained from Great Britain by Germany in 1890 to give German South West Africa (now Namibia) access to the Zambezi River west of Victoria Falls. Originally part of Botswana -- then Bechuanaland -- the Caprivi was ceded by Britain to the Germans in a complicated land exchange deal designed to link German colonies from west to east Africa. During the 1970s and 1980s, the territory was used as a rear base by the South African army at the height of the apartheid era in its war against the Namibian independence movement, SWAPO (today�s governing South West Africa People�s Organisation), and as a support base for UNITA, the Angolan rebel movement then backed by the Western powers in the proxy war against Angola�s Soviet- and Cuban-backed government. The Caprivi is considered strategically important because it is a narrow panhandle extending out from Namibia's northern border contiguous with four other countries -- Botswana in the south, Angola and Zambia in the north and Zimbabwe in the east. It is also important because some of the arid southern African region's most important rivers, including the Zambezi and the Okavango, run along or through it. And as a popular destination for international tourists, the Caprivi brings in hard currency to the national coffers. The majority of the 100,000 population of Caprivi are Lozi-speaking and share a common history and culture with Lozis across the border in Zambia. Most of the Lozi - an ethnic group of 556-thousand people -- live in western Zambia, while some 70-thousand live in northwest Zimbabwe, 14-thousand in northern Botswana and 17-thousand in the Caprivi. These areas made up their ancestral Kingdom known as Barotseland. The Lozi in eastern Caprivi do not identify with the rest of the Namibian population and in 1994 formed the Caprivi Liberation Front, which began campaigning for a measure of autonomy to pursue closer ties with the Lozi in western Zambia. Leaders of the Caprivi nationalist movement have met with Zambia�s separatist Barotse Patriotic Front. The Caprivi movement had found support among the Lozi people in Zambia because their situation in Ovambo-dominated Namibia is considered similar to their own. An estimated 2,500 Namibians from the Caprivi Strip, allegedly fleeing secessionist tensions, have sought refuge in Botswana. Many of the refugees returned to Namibia this year, but the Front's officials -- including its leader Mishake Muyonga -- have remained in exile. In 1998 the Namibian Government said it had located a military training camp run by the Caprivi Liberation Front, and with the discovery 15 Front officials fled to Botswana. 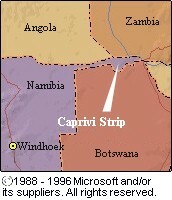 In August 1999 the Namibian Government imposed a state of emergency in the eastern part of the Caprivi Strip. That government action came after at least fifteen people were killed in an attack by members of the Caprivi Liberation Front on a military base, police station and other installations in the small town of Katima Mulilo. It is estimated that between 300 and 600 people have been detained on suspicion of ties with the separatist Caprivi Liberation Army.